Q. How do I find and borrow books that are recommended in RBR ? If you know the title of the RBR book, you can search for the items placed in RBR as per usual by looking for the author or title of the item. If instead you are looking for RBR by module code or lecturer's name you can search using the RBR tab on the library home page. Additionally the Books and Media Tab also allows users to search specifically by the lecturer's name by clicking on RBR COLLECTION (Lecturer's Name) or course number by clicking on RBR COLLECTION (Course Number). 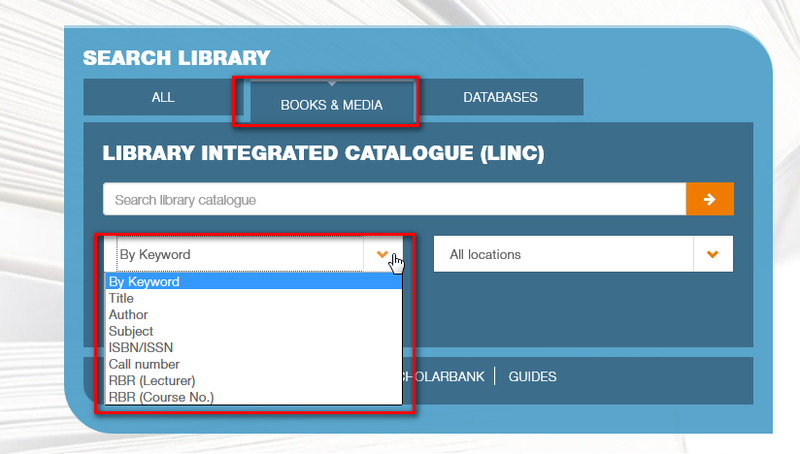 Searching by Lecturer's name and Course Number is not applicable to the Medical Library RBR Collection, unless the module code is provided to the Library. Once you have the call number and the item available you can collect the RBR Item from the loans desk of the library. For Central Library the procedure is slightly different, please see video below on how to obtain the item. Note that RBR books are to be requested on first-come-first served basis and cannot be reserved in advance.